Cancer and Wisdom of the Body (WOB) How to measure health? -- In cancer and other chronic diseases, treatment does not restore health. It induces a new kind of health. -- Health is relative. It may be better or worse. -- Treatment objective is not to restore health, but to establish the best health in circumstances. -- In order to establish the best health, medicine needs a health measure. How does cure fit into this scheme? It does not restore health, and in chronic diseases it does not eliminate disease. Nevertheless the oncologist regards mastectomy as cure. He will adhere to his view even after new cancer manifestations have appeared. Now he distinguishes between local cure, which failed and systemic cure, that has to be achieved. The "cure" concept has a serious disadvantage. Its definition depends on the ultimate fate of the patient. If dying from cancer, she was not cured. On the other hand suppose that a patient has undetected micro-metastases and dies from an heart attack, she is regarded as cured from cancer. This faulty concept distorts oncology reasoning, introduces bias to cancer epidemiology, and breads unreliable statements which cause epidemiology to spread disinformation. Cure ought to be replaced by remission. Remission depends on observation. If you see it, it relapsed, and if not, it's in remission. Remission-relapse was first introduced in leukemia, an incurable disease where treatment objective was to restore remission and maintain it. These concepts ought to be applied to all chronic diseases. Relapse means recurrence of the disease, and since this concept is established in medicine it will be redefined slightly. A diseases is either hidden (pre-clinical) or overt (clinical). When hidden it is in remission, and when detected, in relapse. Before cancer is detected, it is in remission. When diagnosed, it relapses, and mastectomy induces remission. -- In cancer and other chronic diseases, treatment is directed to induce remission and establish the best health quality in circumstances. -- Each remission has a different health quality. 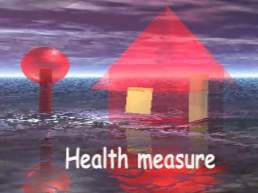 -- In order to establish the best health quality, medicine needs a health measure. Let's return to Canguilhem's analysis of health. "Health is a margin of tolerance for the inconsistencies of the environment". "To be in a good health means being able to fall sick and recover, it is a biological luxury". "Inversely, disease is characterized by the fact that it is a reduction in the margin of tolerance for the environment's inconsistencies." The more threats your body can handle the healthier it is. The greater your tolerance to environmental threat the healthier you are. This important definition will be illustrated by few examples. Each example will compare the functioning of two individuals. -- A weight lifter is healthier than a sedentary. Provided that all other functions in both individuals are the same. His tolerance to weights is better than that of a sedentary. -- An athlete has better tolerance to myocardial infarction, than a sedentary . -- A jogger has better tolerance to bone fractures than a sedentary. -- A vaccinated person has a better tolerance to smallpox than a non vaccinated. -- Since an elderly does not get childhood diseases, his tolerance to childhood disease is better than that of a child. When a plague kills 20% of the population, one may conclude that prior to the plague, 80% had a better tolerance to it, than the unfortunate 20%. The toxic dose which kills 50% of animals, known as LD-50, indicates also that the other 50% had a better tolerance to this particular poison. -- In cancer and other chronic diseases, treatment is directed to induce or maintain remission with the best tolerance. -- Since only WOB knows how to maximize tolerance. Treatment ought to support WOB.. If WOB is so smart why does it need assistance? WOB is there to optimally maintain life with the available resources. WOB cannot accumulate resources. All it knows and cares about is how to best utilize available resources. Suppose that a sedentary person decides to become an athlete, it means accumulating resources (muscle) and raising his tolerance to osteoporosis. This decision is initiated by the mind, which then asks WOB to support its will. This is the virtue of the Cancer-Yogi whose WOB knows how to sustain remission. Its is also the secret of the Smoker-Yogi who increased his tolerance to cigarettes. When an essential substance, like vitamin C is missing, WOB cannot get it. As deficiency deepens, WOB will reshuffle processes to sustain life. Initially deficiency, will be compensated and patient healthy. When WOB fails to control vitamin C dependent processes, it makes the patient feel miserable, which is a message to the mind to get help. The physician diagnoses Scorbut and treats it with vitamin C. Without his help WOB would continue sustaining life until the patient dies. This is where medicine comes in. Its task is to provide resources which WOB and mind cannot get.